« Classroom Crisis has doomed anime. The fight scenes in F/SN don’t look all that great. It varies from fight to fight, but some of them, like Archer vs Berserker feature characters that basically stand still before making a single leap. A few of the better ones feature a bit more movement though. I can’t really fault F/SN too much on its animation though. 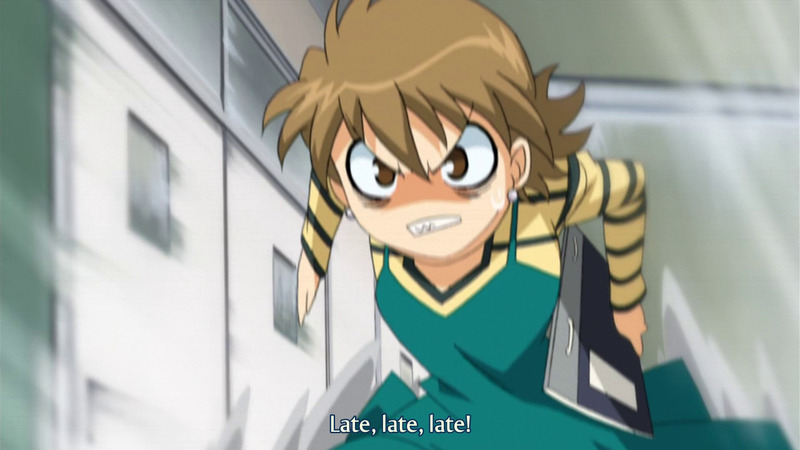 It aired 9 years ago and I have no idea what good animation looked like back then (definitely better than this, but how much is a bit unclear to me). If you exclude some of the fights and the occasional scene with stick figures, most of F/SN doesn’t look that bad actually. At the very least, it is totally watchable and some of the cinematography is pretty good. I like how it plays with lighting in many scenes and I really like how it doesn’t stick to a “everyone is gloomy and serious” look, instead opting for goofy facial expressions quite often. I had heard that Fate route Emiya was worst Emiya. To an extent, this is true. The beginning of the anime has quite a bit of “no, Saber, you are a girl, you shouldn’t fight and get hurt” and that gets annoying. 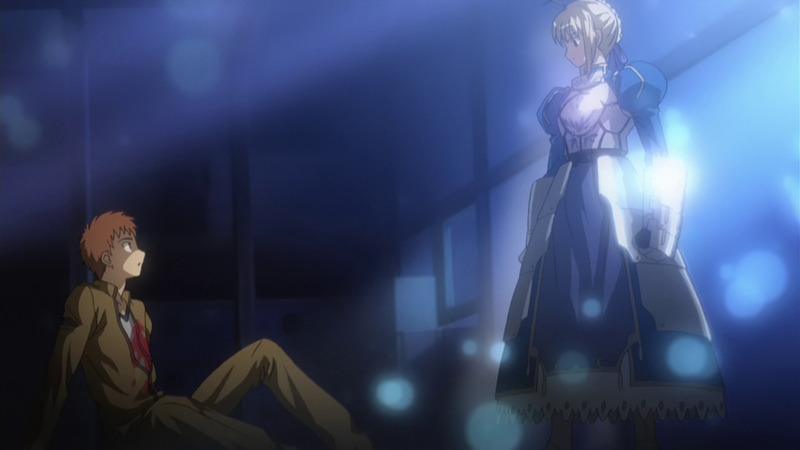 I felt sorry for Saber and her being summoned by a useless master. Emiya gets a fair bit better when he summons Saber during the Rider fight and admits that yes, he does need her help after all. 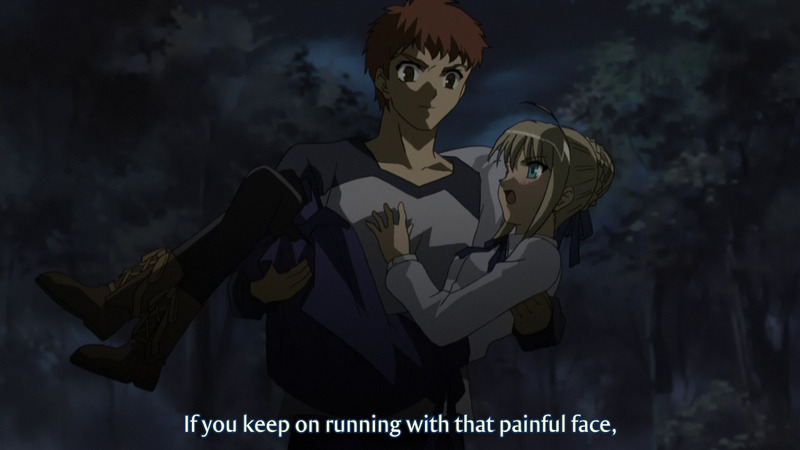 After that fight, Shirou begins fighting with Saber, but he still insists on being her protector, which is rather dumb. He still insists that Saber shouldn’t fight unless she has to. 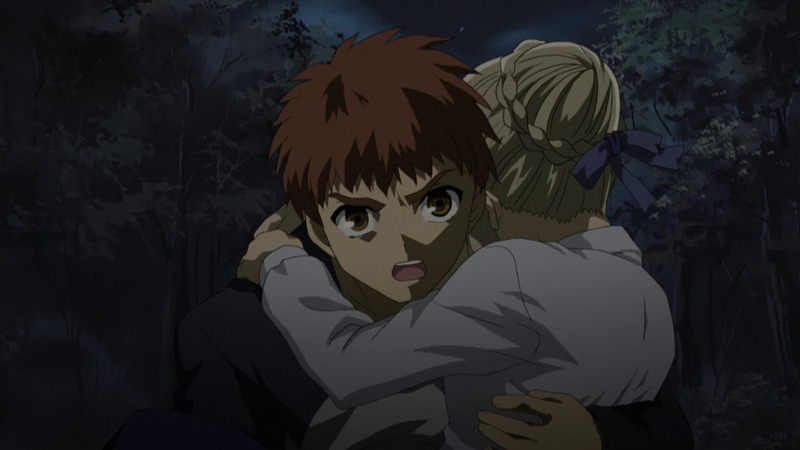 Shirou’s overly chivalrous nature continues to be annoying throughout, but he gets better. Somewhere along the line (towards the end), he really does sort of start caring for Saber in a more genuine way. He does begin to respect her wishes, even if they colide with his own. I liked that. 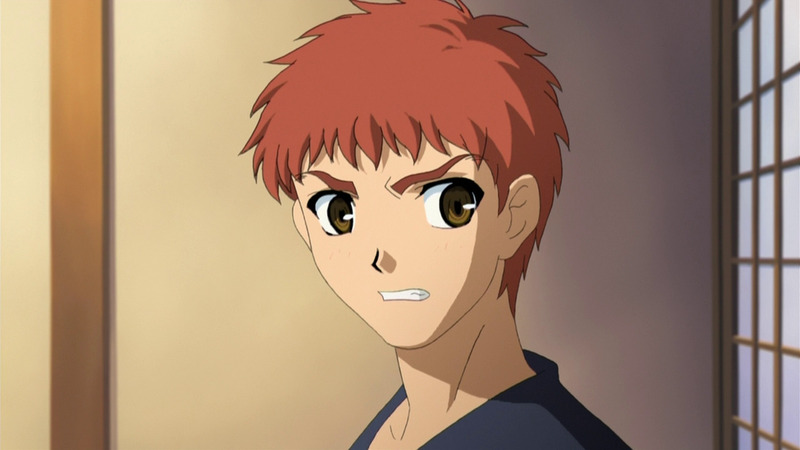 I liked that Shirou actually grew up a little by the end and became far more tolerable. The Shirou we see at the end is a genuine improvement over the Shirou we see earlier on. At his worst, Fate route Shirou is a lot less tolerable than UBW Shirou, but at his best, Fate Shirou is more dynamic and interesting. 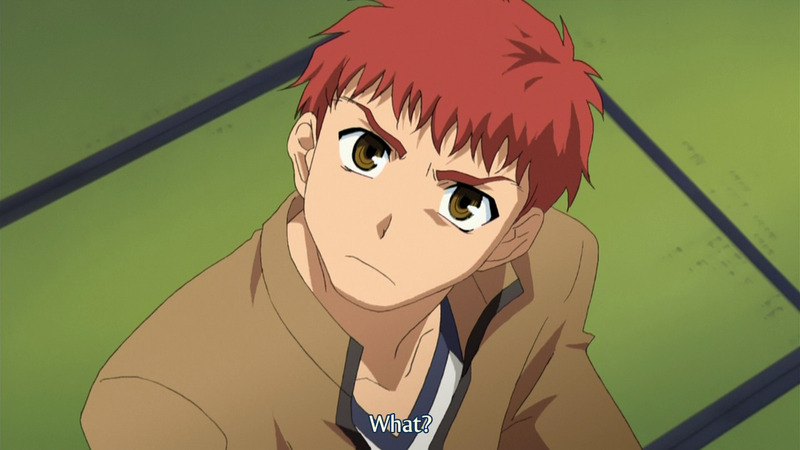 In UBW, Shirou is told he is an idiot, but refuses to change because he is a stubborn mule. In the Fate anime, Shirou does change and more importantly, he is the one telling others (mostly Saber) they are dumb and need to give up their ideals. It is an interesting contrast and coming from UBW, I couldn’t help but be fascinated with how different Fate route Shirou is. A general complaint about the Fate route (especially made by fans of Saber) is that Saber was totally mishandled here. She wasn’t given the route she deserved. I would have to agree. The Saber summoned here is weak. Bound to a useless master, she has almost no mana. A single use of her big attack puts her in bed. The plot does give “reasons” for her weakness : summoned by a useless mage, not a complete servant, etc, etc.. But honestly, it just shouldn’t have made her so weak in the first place. The funniest thing is that by the end of the series, Saber is no longer weak (or at least not this weak). She undergoes that ritual thing with Rin and gets Avalon and stuff, so she can totally fire off a bunch of Excalibers without dying. Why couldn’t she be that strong from the get go? Or, even if you insist on keeping to the rules, she could have been buffed up shortly after her summoning. She shouldn’t have been kept weak for so long. 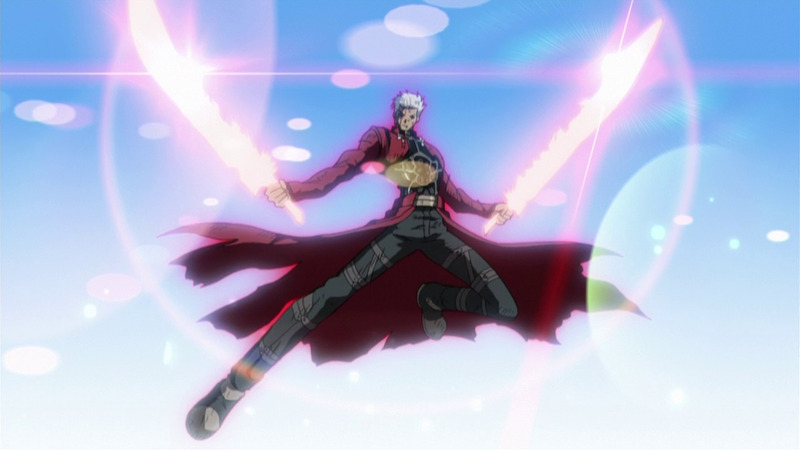 It was stupid and a disservice to F/SN’s most important character. Similarly, the blushing Saber in love was terrible. There is a scene earlier on when Shirou walks in on Saber and she is all “don’t worry about seeing a servant’s naked body”. Later on, he does the same and she is all “you wouldn’t want to see this muscular, un-womanlike body”. That was probably the worst scene in the entire anime. I am not even kidding. Terrible! Why would you make Saber say such a thing. 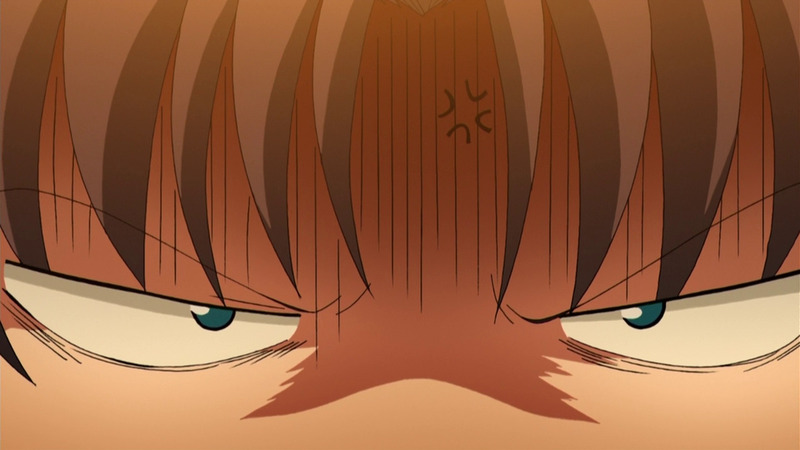 F/SN UBW had a lot of amazing Rin faces and a few good Shirou faces as well as a few really sad Archer faces. The faces in F/SN (2006) were much more exaggerated and were often very goofy. 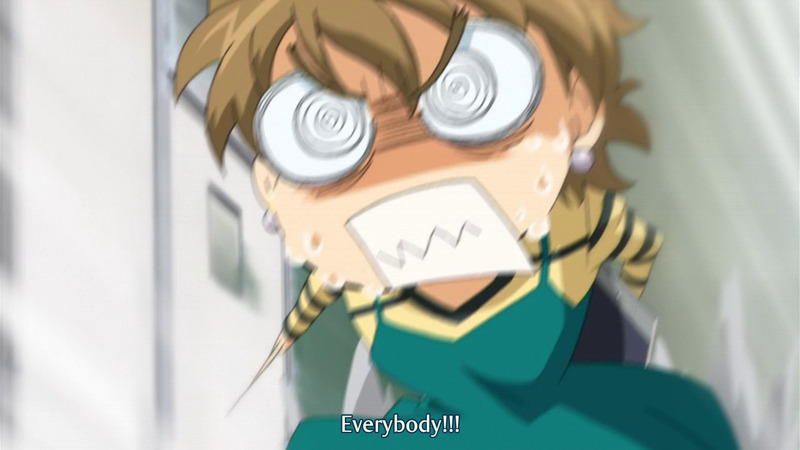 The best faces were of course made by Taiga. I like this goofy, childish side of F/SN. UBW was very clinical and kind of cold. UBW was a better series overall, but I gotta admit, F/SN (2006) has a bit of that “anime charm” most of us like so much. I alluded to it earlier, but one of the reasons I started watching F/SN (2006) was because the music in the Archer vs Berserker fight was so good and the comments on the video all seemed to suggest that this version of Fate had amazing music. I wasn’t disappointed with the music. It was really good. I am not going to claim that F/Z or F/SN UBW had bad music, but the music in F/SN (2006) was much more prominent. UBW opted for a very subtle approach to music. A lot of the anime didn’t have background music and when it did play, it was truly background music. The music in UBW is like a thin layer of chocolate that makes your cake better, but is never the most important thing in your cake. The music in F/SN (2006) is a like bucket full of whipped cream poured on top that drowns out everything else, but you know what? Whipped Cream is delicious, so it works! 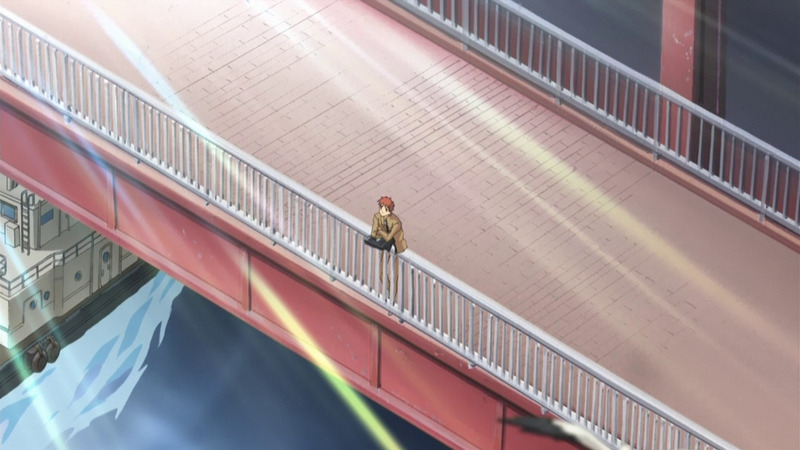 There were many scenes in F/SN (2006) where I’d have been content to just close my eyes and listen to the music. The on-screen stuff wasn’t all that interesting and all that important, so it really wouldn’t be much of a loss if you did do just that. The opening and ending songs are all very good as well. As noted earlier, I wasn’t a fan of Saber falling in love. I was also not a fan of the love-struck Shirou for much of his tenure. And to be honest, I went in not wanting to support Shirou x Saber at all. Shirou x Rin isn’t great, but it is better than Shirou x Saber, if only because it feels more mutually beneficial. I am hoping Shirou x Sakura ends up really good, but I am not going to get my hopes up. 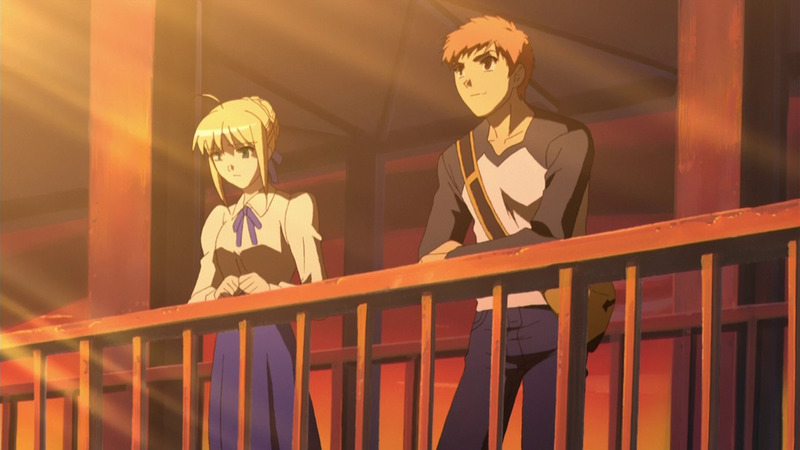 Anyway, I wasn’t really looking forward to the budding romance between Shirou and Saber. And I was sort of right. Their relationship was kinda stupid with Shirou going on about how Saber shouldn’t fight and how he loved her and Saber claiming she will fight and that Shirou should have no say over her life. It wasn’t a good relationship, but, but, but….I would be lying if I said there weren’t any good moments. Not really a wanted hug, but ehhh, kinda sweet though. No, there were a few, very tender moments that to me felt genuinely sweet. I liked the date episode (episode 20) and while Shirou spouted a lot of love affected nonsense towards the end, he was right about Saber’s silly ideal of wanting to redo the king selection. Shirou was right in that Saber didn’t really owe her people anything. I hate to admit this, but even that hug and kiss were sort of sweet. 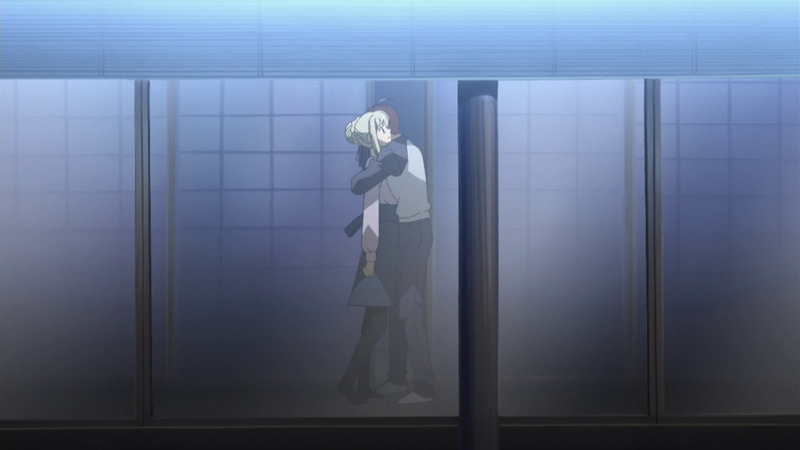 Their relationship definitely got better from then on, and it was at its best when Shirou and Saber realized the truth of what they should do and want. Shirou had already realized that he just wanted Saber to stick around, but by the end, he realized that his dream was stupid. Saber didn’t belong here and she genuinely did want to go back. Even if she didn’t want to save her country, she had to go back. 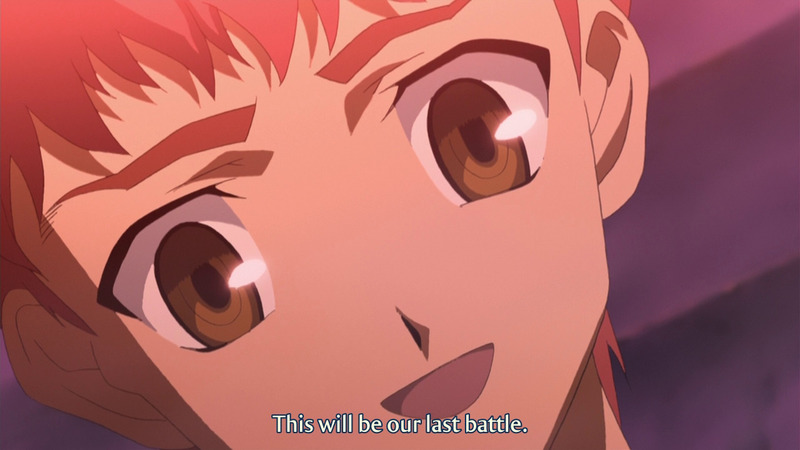 More importantly, Shirou realized it was wrong of him to defy her will and go against her. Saber realized that not only could her wish not be granted, but it was a stupid wish all along because Saber had done her best. She had become a King and while she felt she didn’t do her country justice (not true at all), she absolutely held up her oath. Those realizations combined with the fact that the grail was useless and evil spurred on the last little bit and that was genuinely good. 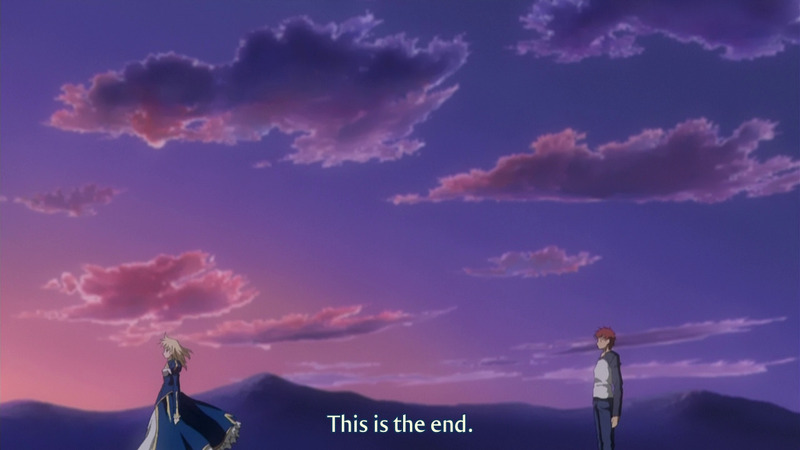 Both Shirou and Saber realized they couldn’t stick around and they came to terms with it. Sure, the final fights were silly (Shirou overcoming the curse his dad also had was kind of touching though), but the resolution found by the two at the end was neither wrong nor silly. I came to respect them for that. 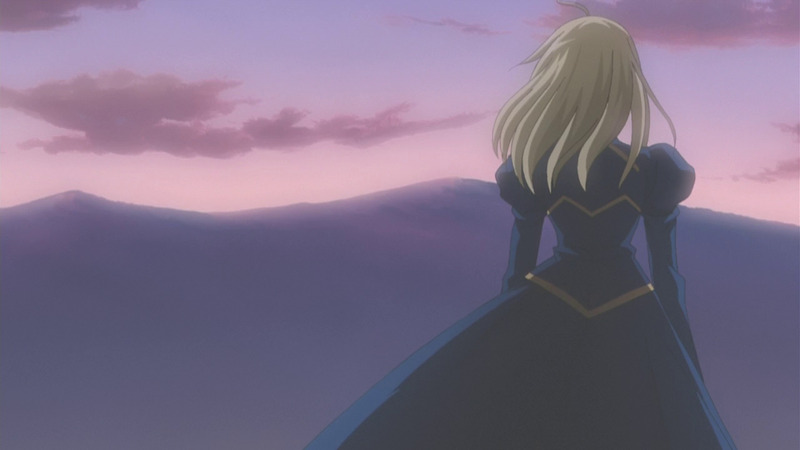 I really liked Saber’s final goodbye scene. 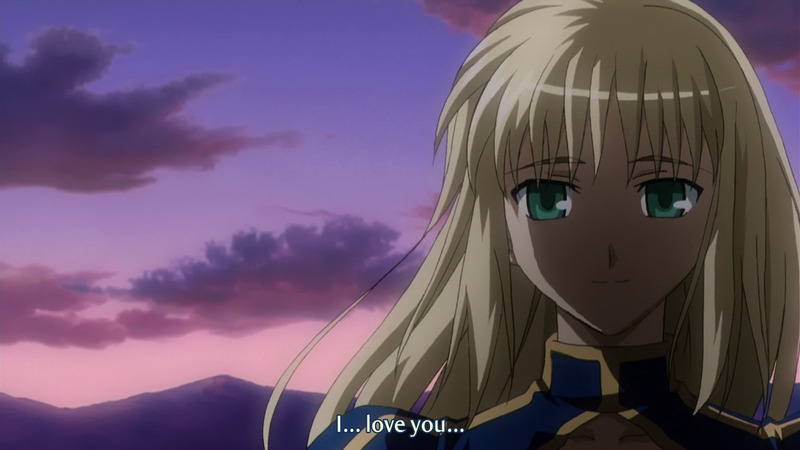 The “I love you” part wasn’t really all that necessary, but how could I, as a viewer, not fall for Saber when she stood like that and said goodbye? Similarly, I liked how Shirou got over Saber. He quickly came to terms with the fact that he wouldn’t see her again as well as the fact that he would soon forget everything about her except that he loved her. That made me gain some respect for Mr.Carrot. I absolutely love the contrast between this and the first image of this post. A risen, troubled king vs one who finally found rest. I am going to join the large number of folk who want a remade Fate route and a better adaptation of it that does justice to everyone’s favourite King. By all means take the Fate route, strip out the useless romcom stuff, strip out Shirou’s chivalry, strip out Saber’s weakness and make it all good. But please, whatever you do, don’t remove Arthur’s end. If you have read my previous Fate related posts, you probably already know this, but I absolutely love heroic deaths. In UBW, I loved Heracle’s final charge. I loved Lancer’s last stand. I loved Hero Emiya’s goodbye. 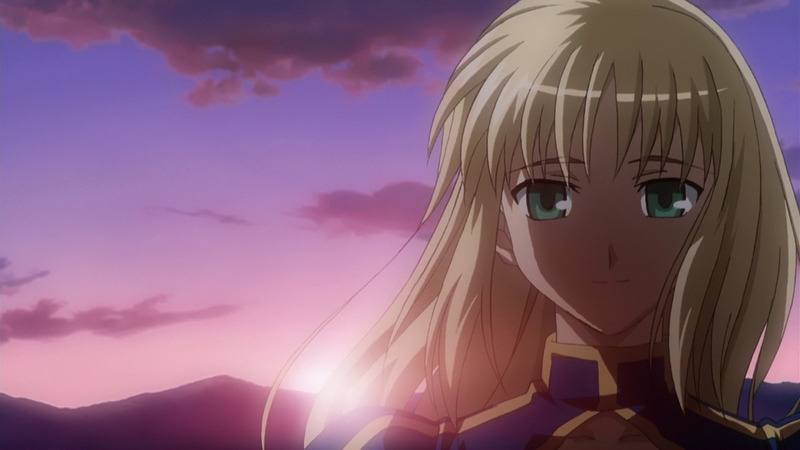 In F/SN (2006) I loved Archer’s end where Illya was forced to acknowledge his skill. I love legends that end in heroic deaths. I love stories where a great leader gives one final order, or stories where an overworked hero finally finds peace. I adore this kind of heroic nonsense. So, you can imagine how much I liked Arthur’s final moments. King Arthur, having never truly died, went back to her time, where she wakes up from her dream. Dying from a mortal wound caused by Mordred (her daughter), Arthur issues a final command to her faithful knight, Sir Bedivere. Bedivere obeys this final order (I am glad they diverged from the legend where Bedivere disobeys the command twice) and returns having given the great sword back to the Lady of the Lake. King Arthur satisfied that her sword was returned, satisfied that she had done her best for her country, finally finds peace and eternal rest. BWAAA. Sniff. Sniff. IT WAS SO SAD AND PERFECT. 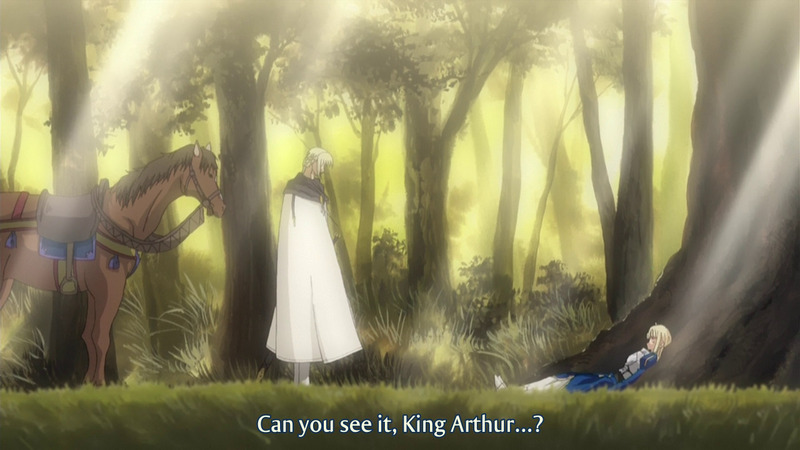 The sad background music was totally right and Bedivere’s reactions too, were perfect. I come close to crying just thinking about it. Sorry, I am such a sap. I can’t handle stuff like this. Stupid Fate. I wasn’t supposed to feel this kind of happy grief. Every Fate series has a lot of misses and a few hits, but when it hits those Chuuni weak points of mine, damn does it hit them hard. This entry was posted on September 27, 2015, 8:11 pm and is filed under Anime, End of Season, Fate/Stay Night. You can follow any responses to this entry through RSS 2.0. You can leave a response, or trackback from your own site.